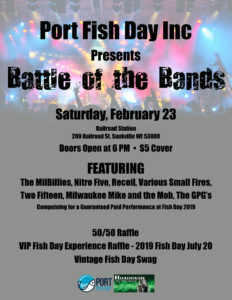 Port Fish Day is a 501(c)(3) non-profit charitable organization which organizes a yearly festival in the Wisconsin’s beautiful Port Washington harbor. The purpose of the festival is to provide an opportunity for area civic organizations to raise money they use to support their individual missions. With four music stages and a number of other entertainment options on the grounds. Port Fish Day strives to provide entertainment for the entire family. National and local music acts performing have included Pop, Rock, Country, Blues, Reggae and a variety of other genres. There are music options the whole family can enjoy. The event kicks off with the Portal Fish Day Run/Walk, and continues with a gigantic parade through beautiful downtown Port Washington. Port Fish Day provides activities for the whole family including an Arts and Crafts festival and Classic Car Show in upper lake park. A Smoked Fish eating contest, Water Soccer fights, and a carnival of games and rides there is something for everyone to enjoy. Port Fish Day wouldn't be possible without the generous donations from our sponsors and partners. We offer a number of ways to be involved with our event. If you're a local company or individual we invite the opportunity to discuss what we can achieve together. Some benefits include VIP passes for the exclusive VIP tent in the Main Stage area, parade entry and recognition throughout the festival. Are you looking for an opportunity to express your creativity? How about putting your creative ideas towards designing artwork for this year’s FISH DAY LOGO DESIGN CONTEST! Area students are invited to design artwork used to promote the 2019 Port Washington Fish Day Festival and the Portal Run/Walk, which is held in conjunction with the Fish Day Festival. Students do not need to be involved in an art class to participate. Submitted artwork will be judged for: Originality, creativity and the graphic best representing the theme – “Dive Into Fish Day 55”. Computer generated artwork is preferred. Prizes will be awarded to 1st, 2nd and 3rd place. The 1st place design will be used on the T-shirt and promotional materials for the Fish Day Run/Walk that benefits Portal, a nonprofit agency that provides services to individuals with disabilities, as well as by the Port Washington Fish Day Festival. The individual submitting the 1st place design will serve as the Junior Parade Marshall for the Fish Day Parade in downtown Port Washington on Saturday, July 20. Additional details for the contest can be obtained by contacting Marlene Morgan at Portal, 377-4410. All entries are due by March 1, 2019 and are to be mailed to Portal, Inc., P.O. Box 65, Grafton, WI 53024-0065. Designs can also be dropped off at Portal during business hours (Monday-Friday 8:00 a.m.-4:00 p.m.) at 1015 Cedar Creek Road, Grafton. By hosting an event that provides local charitable organizations with an opportunity to raise funds for their individual missions Port Fish Day enables many community events and giving programs. Boy Scout Troop 875, Leaders Summer Camp Fees. Boy Scout Troop 875, Camping Equipment. Boy Scout Troop 855, Leaders Summer Camp Fees. Cub Scout Pack 3855, Registration. The Food Pantry, Food and Equipment Donations. St. John XXIII Parking lot maintenance. St. John XXIII paper product for meeting usage, (plates, coffee cups, napkins, etc. The Port Washington Yacht Club’s Scholarship program offers one or more scholarships each year to graduating seniors who are residence of Port Washington that plan to pursue post-secondary education at a 2 or 4-year College, university, vocational-technical College, or proprietary school. The PWYC donates annually to the Port Washington Waterfront Safety Committee and their initiatives. Boating and waterfront safety is promoted and supported with various seminars and presentations from guests speakers that are held at the club. The PWYC also holds an educational flair shoot annually that is open to all that allows boaters to safely dispense of expired flairs.